Do you have a small bathroom but big dreams for it? Tiny bathrooms are very common in older homes and homeowners have taken a stand. Having a small bathroom does not mean your design dreams need to be put on hold. We want to help you maximize the potential of your small bathroom with four easy tips. Tip 1: Make a Statement. Professional Interior Designers recommend incorporating “big” items into your small space. You may think “wait, would not that make your space look smaller?” Actually, no. When you design your space, decorate with large items like a big statement mirror. The same goes for your flooring and backsplash. Try using larger tiles rather than small tiles to help make your bathroom look bigger. Tip 2: Think Proportions. Although you may opt-in for larger decorative pieces, it is a good idea to stick with smaller fixtures. Your toilet, lighting, and sink should be in proportion to your space. The smaller fixtures can actually make the eyes believe your space is bigger than it actually is. If you are looking to add elegance, consider adding a mini chandelier to your space. This will help create a chic design without sacrificing space. Tip 3: Add Stylish Storage. 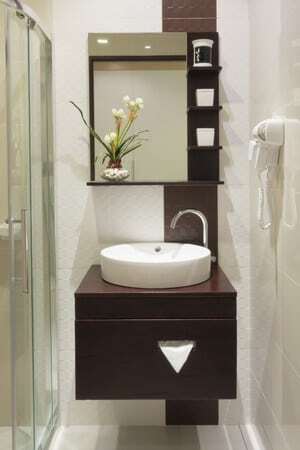 In a small bathroom, storage will be difficult to find. You want to try and include items that serve as decorative and storage pieces. A shelving system over your toilet can help store toilet paper, cleaning supplies, etc. A stylish mirror that opens to hidden storage can hold your toothbrush, floss, razor, etc. Tip 4: Consider Outlets. The smaller the bathroom, the fewer outlets you will find. You may want to consider adding more outlets to your space for maximum usability. There is nothing more frustrating than needing a place to plug something in and finding out there are not enough outlets. If you are looking to redesign your small bathroom, we would love to help. We carry tile for your floor and backsplash all at amazing prices. If you would like to learn more, feel free to contact us or visit one of our showrooms.